Long ago, the Emperor of China, in a gesture of peace, offered the Emperor of Japan a giant panda. You have been appointed to the delicate task of caring for this panda and tending to the Emperor's bamboo garden. I picked this up from Spirit Games after watching the play through on Table Top (YouTube channel Geek & Sundry) and was fascinated! The theme, components and artwork all drew me in and I knew it would probably go down well with my gaming group. I'm well happy with the game as it has fully lived up to that expectation! This is a fairly light and easy to pick up game, where you are choosing actions in order to complete objective cards. Players will be placing garden tiles, moving the gardener and placing irrigation in order to grow bamboo, and moving the panda in order to eat different colours of bamboo. The winner of the game will be the one who has amassed the most points through completing the objective cards. 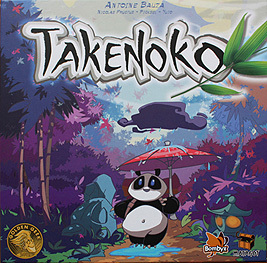 The cards fall into 3 categories; tile patterns (completed by placing the right tiles and irrigating them), bamboo patterns (completed by managing the bamboo stack heights by using the gardener and panda), and finally getting the panda to eat the correct bamboo sections that the cards demand. The game is shaken up a bit by a dice rolling mechanic which determines the weather which can have affects that allow you to vary your actions and can be used to improve your situation most of the time. The game has lots of hidden depths as you decide which actions are going to best further your cause, being mindful of what other players are doing as well. This game is so awesome. It goes down well as a 2 player game with me and the wife and with a larger group of 4, especially if you have 2 couples playing! The components and art are STUNNING, this game will really turn heads, the gardener and panda miniatures are spectacular, and when the game has reached an advanced stage with all the colours and bamboo stacks out it looks amazing! Well worth a look for most gamers I think.